To describe Amazonia (2013) as a Brazilian-French documentary is to make it seem tedious and dry, and that couldn’t be further from the truth. 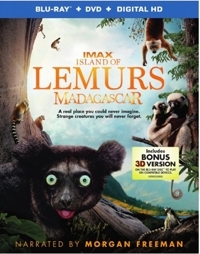 This live-action nature film is a wonderful choice for family movie night, for a number of reasons. director Thierry Ragobert opted to combine nature photography with a fictional storyline. 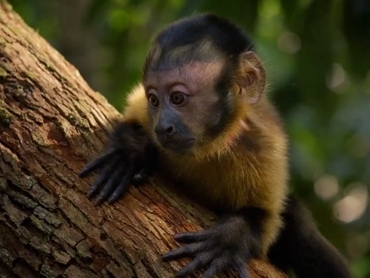 In this case, a born-in-captivity capuchin monkey named Saï (pronounced “psy”) finds himself flying out of Rio across the Amazon jungle. When the plane crashes, he’s left on his own to learn how to live in the wild for the first time in his life. We’re so focused on the cute little guy and his adventure that the voiceover lessons about the Amazon seem like fun facts rather than pedantic distractions. You’re glad you learned that there are over 2 million species of insects in the Amazon, for example, or that the rainforest provides a full 20 percent of the planet’s oxygen. You get the idea of how important it is to preserve the Amazon, and yet Ragobert doesn’t hit you over the head with an environmentalist message. It’s all about a monkey and his fascinating adventure. often frightening to other children. Amazonia is unique in that there is only one instance of a predator snatching prey, and since it was another monkey you find yourself less traumatized than you are relieved it wasn’t Saï. Though Amazonia is all about survival, it’s mostly upbeat. 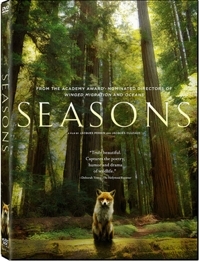 It’s the gentlest and most fun nature film I’ve seen, in fact. Even when Saï comes across an anaconda that could swallow him whole, the confrontation is quickly ended, but in a positive way. Same with every obstacle or danger the little guy faces along the way. Only when, starving, he eats some mushrooms and Ragobert gives us his version of “Pink Elephants on Parade” does the tone change briefly weird. Otherwise it’s all lightweight adventure and fun lessons learned about the Amazon. #3—It turns out that Disney and BBC haven’t cornered the market on nature photography after all. Gustavo Hadba and Manuel Teran do a wonderful job of shooting in the rainforest and capturing all sorts of creatures in the process. 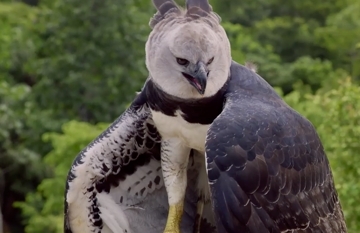 Aerial shots and sequences involving a harpy eagle and jaguar on the hunt are especially impressive, but there are also wonderful close-ups of such creatures as frogs and snails and sloths. Did you know that sloths are good swimmers? We see them doing their thing thanks to underwater cameras, as we do pink river dolphins at play. 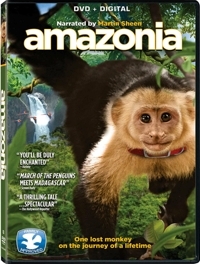 #4—Amazonia manages to sustain some credible tension despite the fact that it’s pretty lightweight as a nature film. There isn’t a lot of violence here, or predators tearing prey apart as you’d likely see elsewhere. Yet, I have to admit that I found myself in a state of tension a number of times. That’s a testament to the script, editing, and direction. 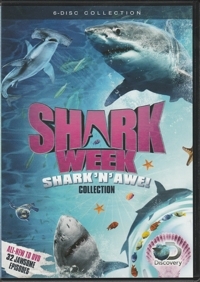 The filmmakers have really woven together a compelling narrative with documentary footage and voiceover information. All of which makes me convinced that Amazonia would make for a great first nature film to introduce children to, and even those who don’t respond well to the survival-of-the-fittest world of nature films will find this a welcome change of pace. I have only one complaint: it would have been great to get this in HD. DisneyNature: Bears is an accomplished bit of filmmaking that would have been an unqualified success were it not for narration that periodically insults the intelligence of viewers over the age of eight. The screenplay and voiceovers are, as my teenage son said, simply “childish” in places—meaning that Bears is clearly aimed at very small children, the way an adult will make funny faces to try to make a toddler laugh. The question is, why? Why narrow your audience like that, when the subject matter has such broad appeal? The Alaskan cinematography in Bears is breathtaking, and the sometimes extreme photography really adds both epic sweep and intimacy to our understanding of these beautiful creatures. 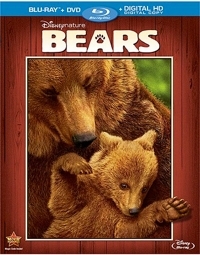 Couple that with perfectly paced scenic construction that builds suspense as we follow a family of Alaskan brown bears from the birth of two cubs through their first year of survival and you have a nature film that’s every bit as good as what Disney produced in the past—or, for that matter, what other studios are producing now.